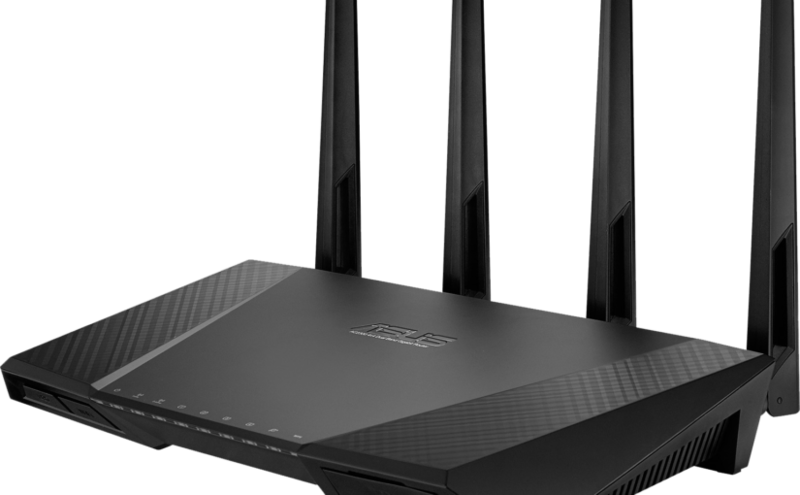 ASUS RT-AC87U & RT-AC87R – The Best 802.11AC Router - AL-HaYaT Telecom LTD. The 87U features a number of key specifications including the distinction of being the first “wave 2.0” 802.11AC wireless router. I have detailed some of the most important features and specifications to provide a sense of what the unit brings to the table relative to other wireless routers currently on the market. Ultra-fast Wi-Fi router with a combined dual-band data rate of 2334 Mbps and world’s fastest 5G at 1743 Mbps ideal for multiple high bit rate video streams as well as local playback of HD or UHD video files, large file transfers or system backups as well as low-latency online gaming. World’s first 4-antenna, 4-stream design with AiRadar & universal beamforming offering the potential for expansive wireless signal coverage up to or greater than 5,000 square feet (over 465 square meters). Additionally featuring implicit and explicit beamforming ( universal beamforming ) for superior client reception and throughput and environmental response. 2X dual-core CPU with dedicated 5G Wi-Fi processor and unique hardware structure for robust multitasking performance, superior stability and the best WiFi performance for 5GHz 802.11AC as well as simultaneous utilization of 802.11AC with USB 3.0. 256MB DDR and 128MB DDR onboard memory enables roubust performance dedicated memory for each chipset. Built-in USB 2.0 and USB 3.0 ports with high power output design enabling robust connected device flexibility including USB attached storage streaming, syncing or sharing of files via AiCloud, FTP connections and locally connected PCs. Additional support for printers and multi function devices as well as support for ISP connectivity with support for 3G/4G devices. High power output ensures superior compatibility and performance with the widest range of bus powered storage devices. ASUSWRT firmware with advanced graphical user interface for easy, CD-free / sofware-free 30-second setup whether it be on a desktop, notebook, smartphone or tablet. Additionally featuring robust network monitoring, management and control. A class leading firmware offering the most feature complete functionality of any high end performance router including parental controls, VPN, FTP, QoS, wireless parameter adjustment, iTunes media server support, media server interoperability with CE devices, dual WAN, WAN to LAN reassignment for 5 LAN ports, Guest Wi-Fi ( guest SSID ) and much more. Advanced router security and protection with AiProtection with Trend Micro helps to assess and secure your router and minimize exploits, intrusions and other malicious attacks. Additionally it can assist in malware protection and prevention. Newly design advanced Adaptive QoS identifies and categorizes home network traffic to intelligently allocate the optimum bandwidth for each application or connected device. Based on advanced deep packet inspection adaptive QoS offers robust optimization with easy management. Additionally it can co operate with NAT acceleration and enables per client prioritization and monitoring. Updated ASUS AiCloud 2.0 to locally connected PCs and attached storage devices to access, sync, share and stream your files from home anywhere you have an internet-connected device. You can even remotely wake up locally connected PCs. Two Stagae Hardware acceleration design “Hardware NAT” offers superior performance and routing throughput.